Most of us live life on some kind of budget. We reconcile our monthly expenses to our monthly income and determine what we can spend on everything from housing to Starbucks. We are no exception and I make an effort to be mindful of our grocery budget, not to waste food, and to be economical (and healthy) by cooking from scratch. That said, I can’t tell you how many times I’ve thrown out a half-used bunch of Italian parsley that’s gone South, the last fourth of a quart carton of yogurt that has expired, or pitched the final portion of leftovers because it had lingered at the back of the fridge for too long. I wince with a small amount of guilt every time this happens. Nevertheless, it still happens pretty regularly. I am fortunate to be able to afford these sorts of budgetary transgressions, but many people can’t. Prompted by a meeting at the San Francisco Food Bank over the summer, chef Karl Wilder was inspired to pilot test the very budget that more than 45 million Americans must follow: food stamps. Wilder determined that a family on food stamps can spend $1.33 per person per meal. He then calculated that if he wanted to incorporate oil and salt into his cooking he would have to lower his per meal price to $1.22. That meant he had a total of less than $4 per day for food. It started as a week-long experiment, but grew into a two-month long project, which he blogged about on his site, Fusion on the Fly. Wilder’s blog offers daily updates throughout the months of July and August, but it was his article for Huffington Post that tracked him through a week of his experiment that I found to be the most concise and captivating account of his project. As I read through a week in the life of Karl Wilder I was struck by a number of things, but what I found most alarming was this: feeding yourself on this kind of a budget is an incredible amount of work. This is a man who is a chef. He knows how to buy what is in season. He knows which independent merchants and which food markets offer the best value. He knows how to effectively utilize ingredients that many people would find obscure. And as best I could tell, for the duration of this experiment he had no other employment obligations. Merely sticking to this budget was his whole job. Consider that most people on food stamps are working multiple jobs for long hours under physically demanding conditions. Cooking from scratch is likely the least appealing thing at the end of such a day. Not to mention that most (would “all” be that big an exaggeration?) of them do not share with Wilder the benefit of a professional culinary education and likely don’t know how to make nearly as much of a food stamp budget as he does. I admit to being bored by [this diet]. I am sick of many of the foods that work in this budget. I am ready for it to be over. For many who live this way it may never be over. We have few jobs in the U.S. and the jobs we have often pay so little food is a luxury. When I say I’ve walked a mile in my brother’s shoes I know that my shoes have custom insoles and by comparison are more comfortable. While Wilder’s second paragraph is more telling when it comes to the nutritional epidemic that is going on amongst the poverty stricken in this country, it is the first paragraph that hits me the hardest. I suspect that many poor people feel they are helpless to change the distribution of wealth in America (by and large they aren’t wrong about that) so the fact that there is a larger issue at hand isn’t what afflicts them on a daily basis. What afflicts them on a daily basis is the fact that they are condemned to a diet that isn’t enjoyable. For most of us food is a significant vehicle for pleasure. It is what brings us together at the table with friends and family. It is a means of relaxation and recreation and communion. 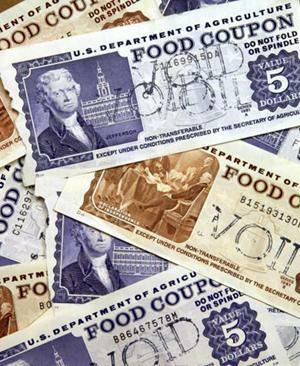 But for people on food stamps food is merely a source of fuel; a source of stress and effort and very little pleasure. I don’t have a solution here. I wrote this post not because I believe I have anything new to add to the conversation. I wrote this post because it made me sad learning about Wilder’s experiment, how difficult it was even for him, and how futile it must be for the 45 million Americans who live it every day. Maybe you were already aware of the complicated nature of this plight. Maybe you were already familiar with Wilder’s project. But maybe you weren’t. Maybe I’ve exposed you to an issue that wasn’t known to you. If that’s the case then I’ve broadened the general awareness around this issue, and I have to believe that can only be a good thing. This entry was posted on Monday, October 24th, 2011 at 5:00 am	and is filed under Culinary, Culture, Health. You can follow any responses to this entry through the RSS 2.0 feed. Both comments and pings are currently closed. What an interesting project, and how sad that he didn’t really reflect on his experience in a more personal way. I think that kind of reflection would make the impact seven-fold, don’t you? Still, I’m intrigued, and am going back to check it out. You are right, though–it’s the crap food that is inexpensive, and it’s sort of like society’s dirty little secret. Wow you did enlighten me Gail. I had no idea. I am stunned to think that anyone could live on $1.22/day for food. I wouldn’t know where to begin. I am heading over to his blog to check this out.